Bowfest 2014 was a hit! Thanks to everybody that came out and made the day excellent! Check back here for pictures, coming soon! 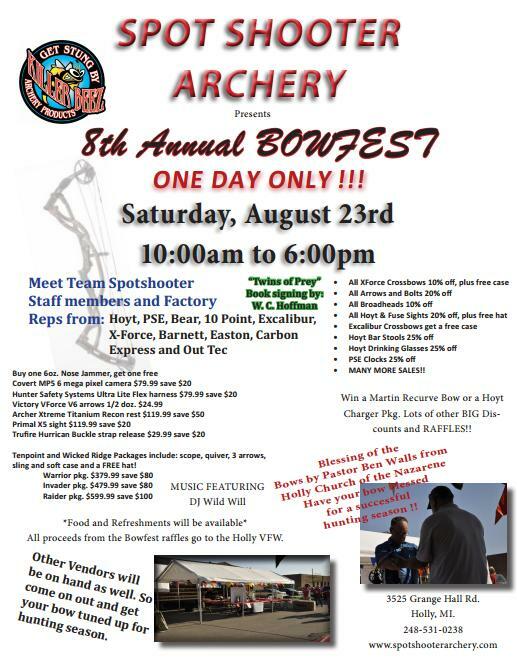 Come to our 8th Annual Bowfest, August 23rd! Check out the flyer below, and click to download and print a copy for yourself! Spot Shooter Archery – we have extended hours and a wide selection of bait for all of you local anglers looking to get out on the water first thing in the morning! Come see us (we are in Holly, on Grange Hall Road – get directions)! Learn how to tune your bow with Spot Shooter Archery! Our Tuning DVDs will take you through the process of tuning your bow. Why settle for Silver – go for the Gold!